Pancreases grown in rats using mice stem cells were able to sustain blood glucose levels in diabetic mice over a year after transplantation with just 5 days of immunosuppression. Though the ethical concerns of human application must still be addressed, this research could provide a viable solution to the problem of organ donor deficiency. Our knowledge of and ability to use stem cell technology has been growing in recent years, and now, a proof of principle study has shown that it is possible to grow and then successfully transplant organs of one species in the body of another — a stem cell chimera, so to speak. The study, published online in the journal Nature, sets up the possibility of growing transplantable human tissue using another species as the host. Researchers Hiromitsu Nakauchi and colleagues were able to demonstrate that mouse pancreatic islets grown inside rats and then transplanted into diabetic mice could survive and function normally for prolonged periods of time. The team injected mouse pluripotent stem cells into embryonic rats that were bred to be incapable of growing their own pancreases. Once the rats were adults, their pancreases, which were comprised mostly of mouse cells, were transplanted into diabetic mice. The transplanted organs, with immunosuppression applied only in the first five days after the transplant, were able to sustain blood glucose levels in the diabetic mice for over a year. 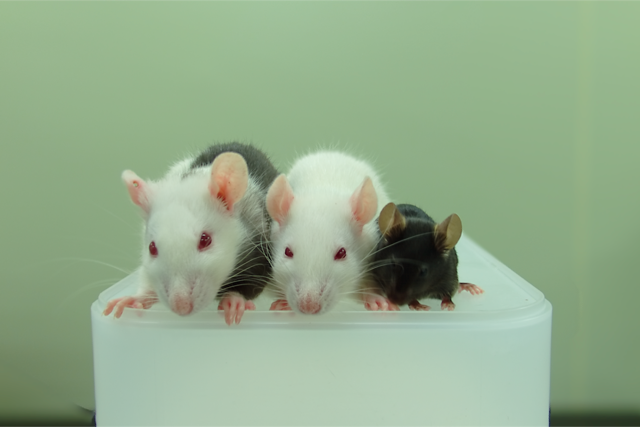 From left to right; rat-mouse chimera, wild type Wistar rat, wild type C57BL6 mouse. Of course, applying the study to human situations still remains a distant possibility. For one, there are technical challenges that need to be overcome — after all, the study is still in its proof-of-concept phase. Organs for human transplant need to be generated in animals that closely resemble humans in both size and evolutionary distance, such as sheep, pig, or non-human primates, the researchers noted. While researchers have previously grown human body parts using other species as the host (such as the well-known human ear on the back of a rat), we have yet to transplant any to human patients. That brings up the ethical and legal questions that need to be addressed for any stem cell-related applications, including the debate over which kinds of stem cells could and should be approved for human applications. Setting these issues aside for now, Nakauchi and his team were able to confirm that pluripotent stem cells have the potential to produce replacement cells and tissues of an unlimited quantity. More over, they managed to prove that these can survive, normalize, and function long after transplant. With continuous study and research, it remains only a matter of time before the method could be adapted for human application.